This cocktail is really easy and only involves two ingredients. To be honest, I don’t even measure them out. I use the very official method of pouring until it looks good to me. Try to stick with a 1 part to 2 parts ratio. Begin with 1 part of cranberry pomegranate juice. Then, pour in the champagne until there is about 1/2 to 1 cm of space left at the top of the glass. If you want an alcohol-free version, substitute ginger ale for the champagne. Toss in a couple of cranberries and that’s it. Cheers! 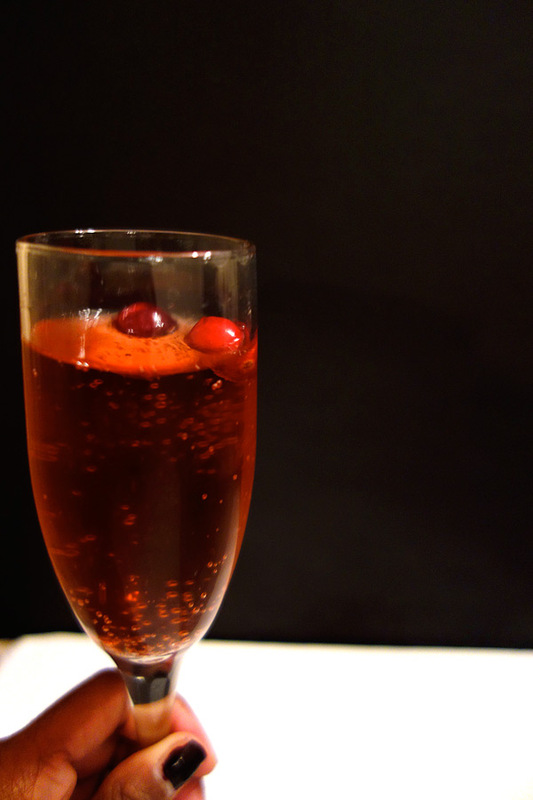 Pour cranberry pomegranate juice in champagne glass. Add champagne or ginger ale and top with cranberries.